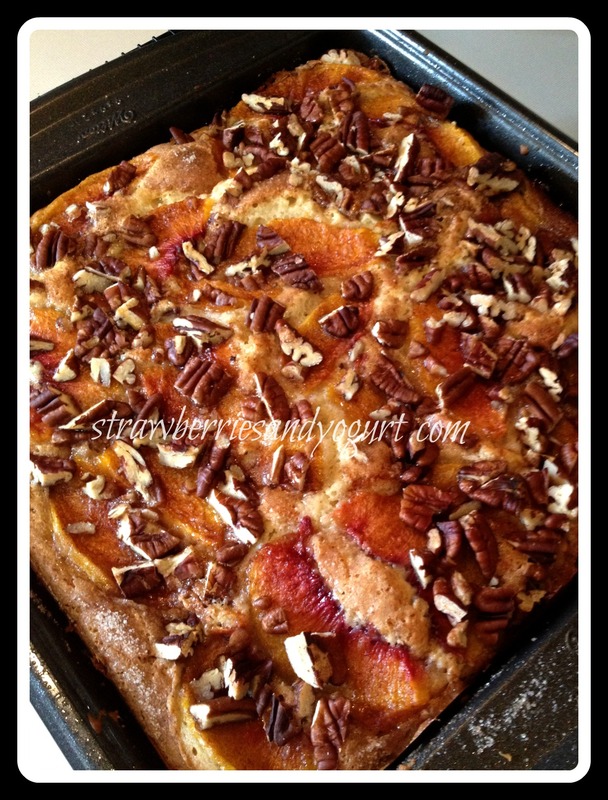 Here’s the second recipe I made with the amazing Georgia peaches Miss K left me! This has been my most successful ice cream recipe to date. I’m struggling with how best to store ice cream in the freezer. Plastic? Glass? Specialized containers? Anybody have any suggestions? I’m also struggling to get my ice cream super creamy. Thankfully, I found this article from David Lebovitz with some tips. 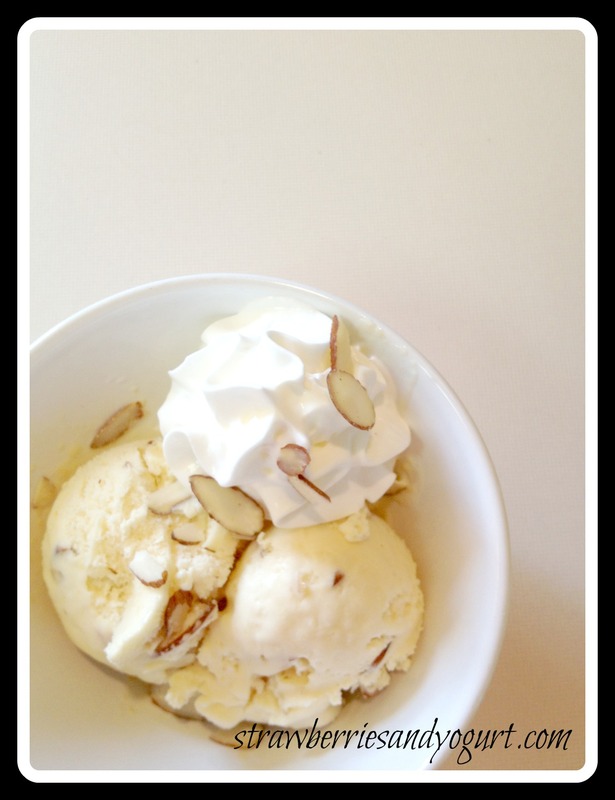 Tips for Making Homemade Ice Cream Softer. 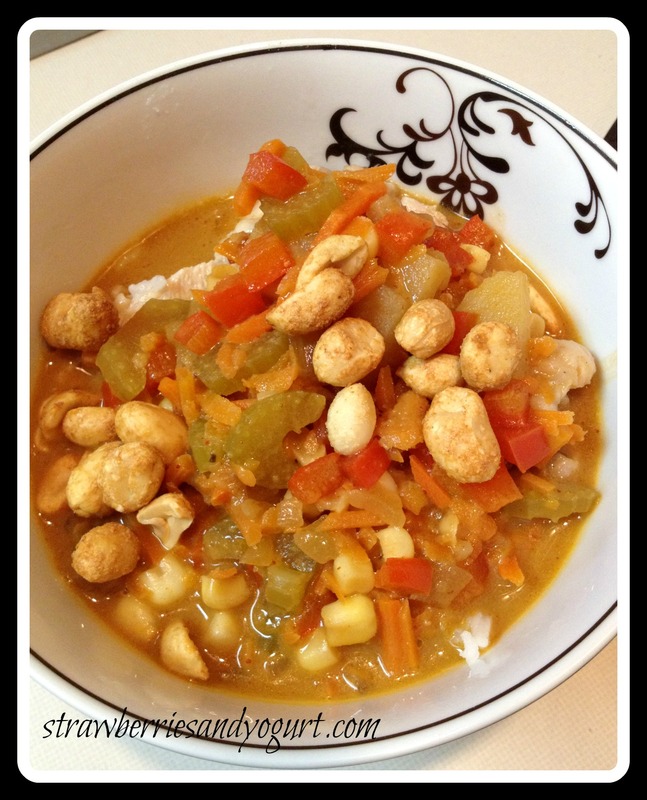 This recipe is from a Table for Two blog, no substitutions were made. Click on the title for recipe. Gosh this ice cream is wonderful, it’s a perfect taste of summer. 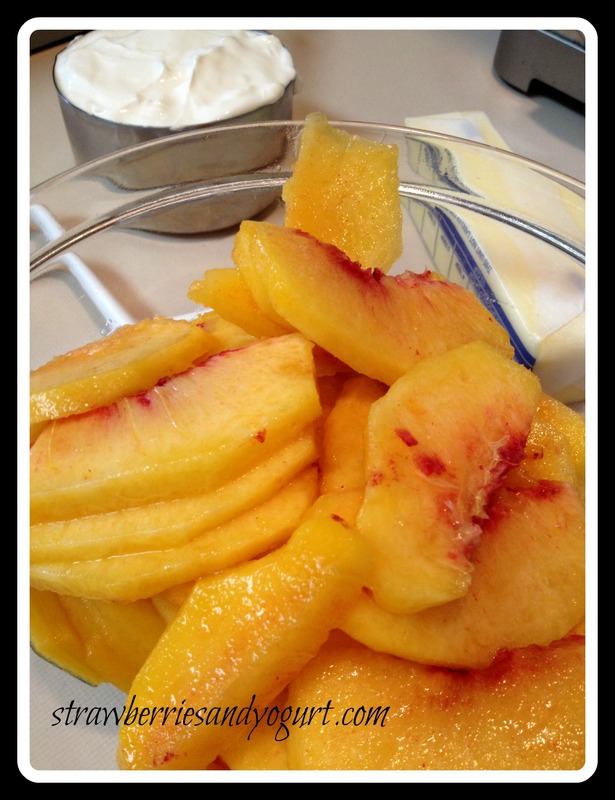 Make this before peaches are out of season! We have had many people stay in our guest room over the four short years that we’ve lived here. Friends, family, students and even a few puppies. It’s a joy to share our home with all of these wonderful people. Our last guest gave me a bag of fresh Georgia peaches and told me to make some fun recipes with them. Here’s round #1. This recipe is from Food Network Magazine, June 2011. Preheat the oven to 350 degrees. Grease a 9 inch square baking pan. IN the bowl of an electric mixer fitted with the paddle attachment, beat the butter and 1 cup of the sugar for 3 to 5 minutes on med-high speed, until light and fluffy. With the mixer on low, add the eggs, one at a time, then the sour cream and vanilla, and mix until the batter is smooth. In a separate bowl, sift together the flour, baking soda, baking powder and slat. With the mixer on low, slowly add the dry ingredients to the batter and mix just until combined. In a small bowl, combine the remaining 1/2 cup sugar and cinnamon. Spread half of the batter evenly in the pan. 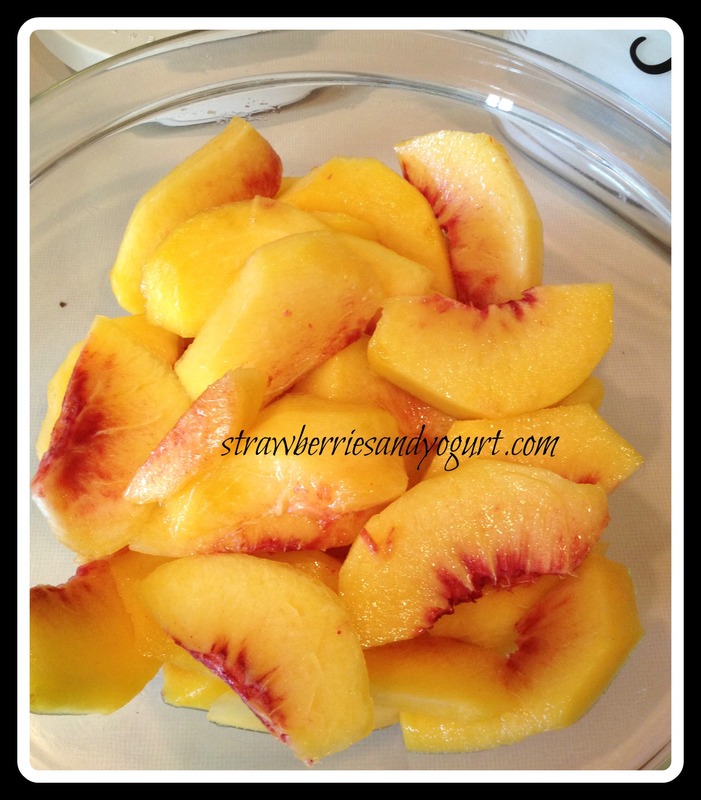 Top with half of the peaches, then sprinkle with two-thirds of the sugar mixture. Spread the remaining batter on top, arrange the remaining peaches on top and sprinkle with the remaining sugar mixture and the pecans. Who doesn’t love bacon? Crispy, salty, rich bacon? And what better way to have a BLT than on a pizza?? This recipe is from Cooking Light, October 2011. Preheat oven to 450 degrees. 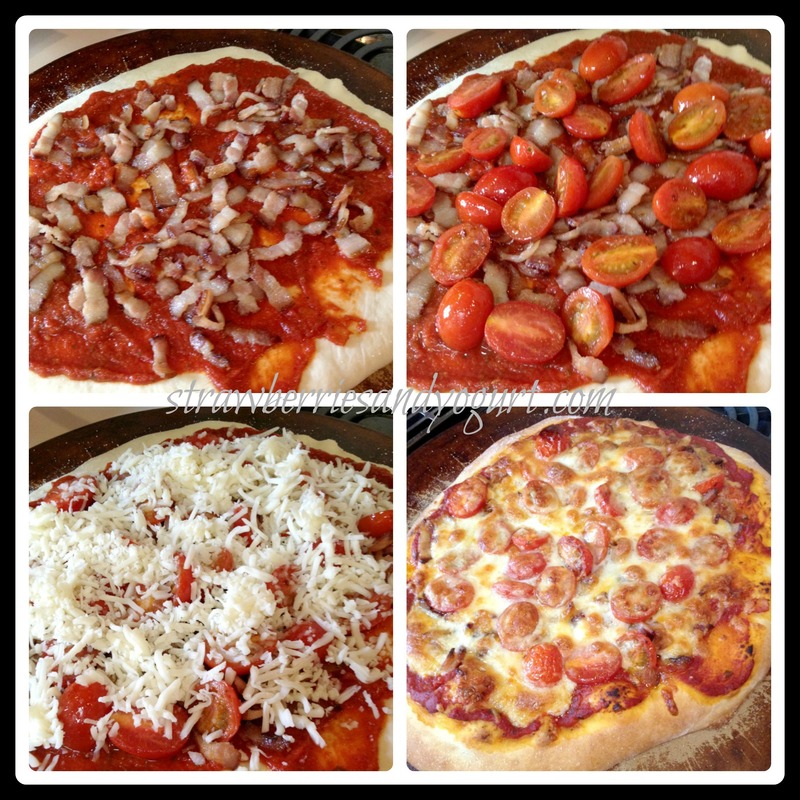 – I recently read a tip about baking homemade pizzas. Put your baking sheet or pizza stone into the oven as it is preheating. This will help to bake the crust evenly and avoid a soggy center. Place dough in a bowl coasted with cooking spray; let dough stand, covered, for 15 minutes. Cook bacon in a skillet over medium heat until crisp. Remove bacon; crumble. Add tomatoes and pepper to drippings in pan; cook 2 minutes, stirring occasionally. Sprinkle a baking sheet with cornmeal; roll dough into a 12-inch circle on prepared baking sheet. Spread sauce evenly over dough, leaving a 1/2-inch border. Top with tomatoes and bacon. Sprinkle cheese over top. Bake at 450 on bottom oven rack for 17 minutes or until crust is golden. 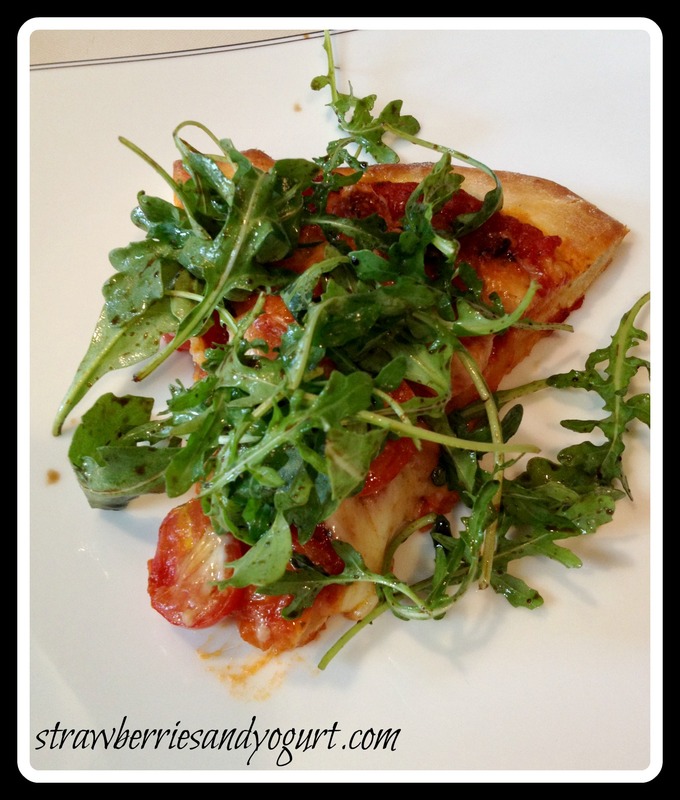 Combine arugula and remaining ingredients; top pizza with arugula mixture. Don’t get me wrong, I love living here in Tennessee. This summer has been beautiful. We have wonderful friends. My home is more than I ever dreamed I would have. But California has some of the best Mexican food on the planet. I miss it – A LOT. This recipe is from the Penzey’s catalog, I’m not sure which edition. Wash and cut the sweet potatoes into bit-sized chunks. Put the potatoes, soy sauce and 1/3 c of the cider vinegar into a large pot and boil until the potatoes are very soft and the liquid is mostly absorbed, about 30 minutes. – After 30 minutes my potatoes were still somewhat firm and the liquid was absorbed. I added about a 1/2c of water and covered. It took another 15ish minutes for the potatoes to soften. In the meantime, saute the leeks, chorizo (if using) and garlic (if using fresh) over med-high heat in a little oil with the cumin until you can smell it halfway out the door. Then add the remaining cider vinegar, chili pepper, the black bean and the garlic (if using dry). Turn the heat down to medium, cover the pan and take a break until the potatoes are done. When the potatoes are finished, mash them, leaving a fair number of lumps. Fold the beans and 1 cup of the cheese into the potatoes. Fill the tortillas with about a handful of filling, roll and pack tightly into a lightly greased 9×13 pan. 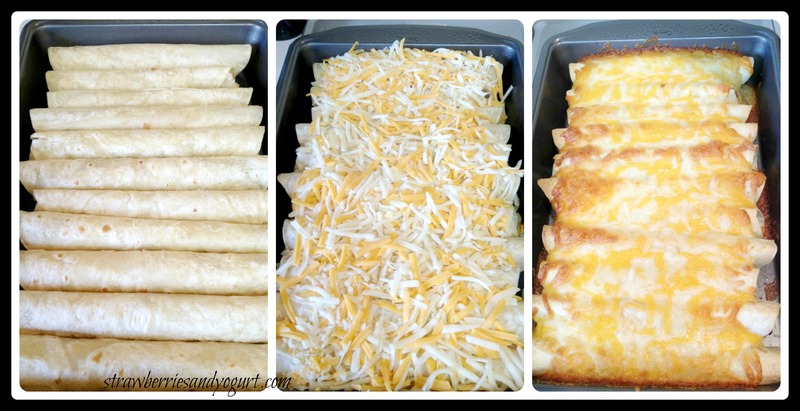 Top the enchiladas with the remaining cheese, and bake at 375 for 25 minutes, or until the cheese starts to bubble. After it’s finished baking, broil for about 5 minutes, to get the cheese really golden brown and toasty. – Mine baked and was golden in the 25 minutes flat. I didn’t need to broil at all. Serve hot with lots of salsa, sour cream, cilantro and napkins. 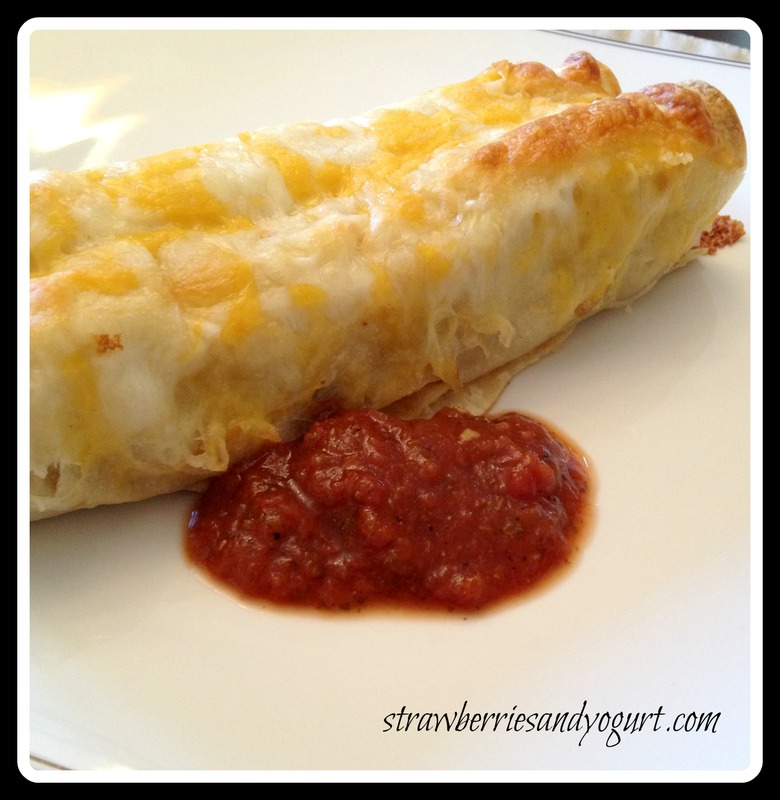 This was a little less enchilada and a little more baked flauta. As you can see from the picture, I used a whole package of tortillas, 11 total; with another scoop or two of filling left over. The sweet potato and the oniony leeks are a great combo. The taste had melded much better the next day. In the future making this exact recipe, I’d make the filling the day before and roll the enchiladas the next day. What I think I’d do in the future is cut down to 1 large sweet potato, add in a cup to cup and a half of shredded chicken and cover the enchiladas in the ranchero sauce from the Black Bean & Enchilada recipe, then cover with the 2 cups of cheese. 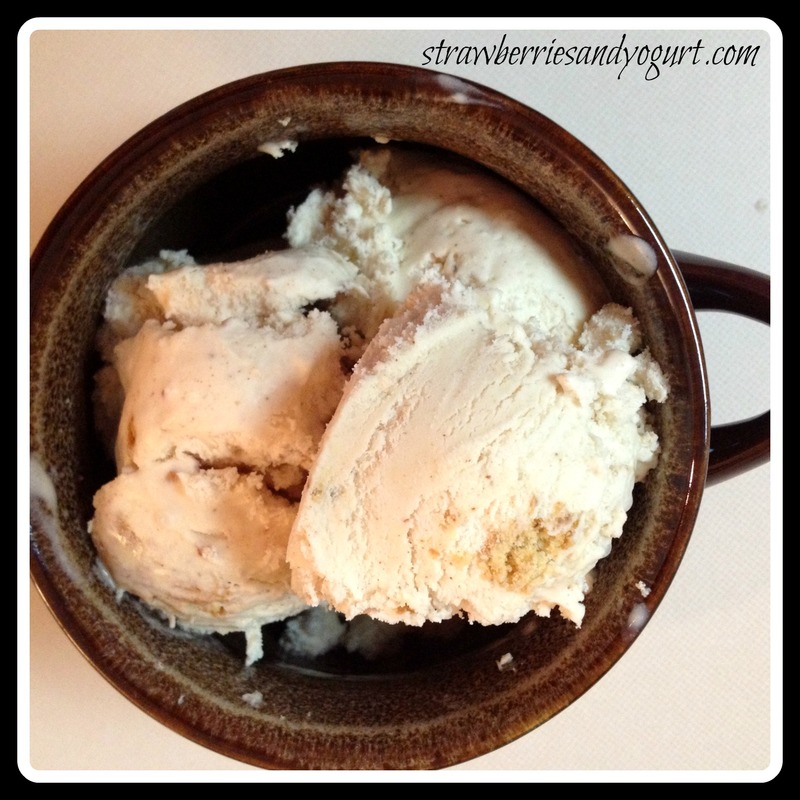 I’m hoping y’all love ice cream as much as I do, because I am intending to wear out my new ice cream maker. We had some friends over for dinner and I thought it’d be fun to have ice cream sandwiches for dessert. And what’s better than chocolate and coffee?? For the cookies I used this recipe for Chewy Chocolate Cookies from Bunny’s Warm Oven. 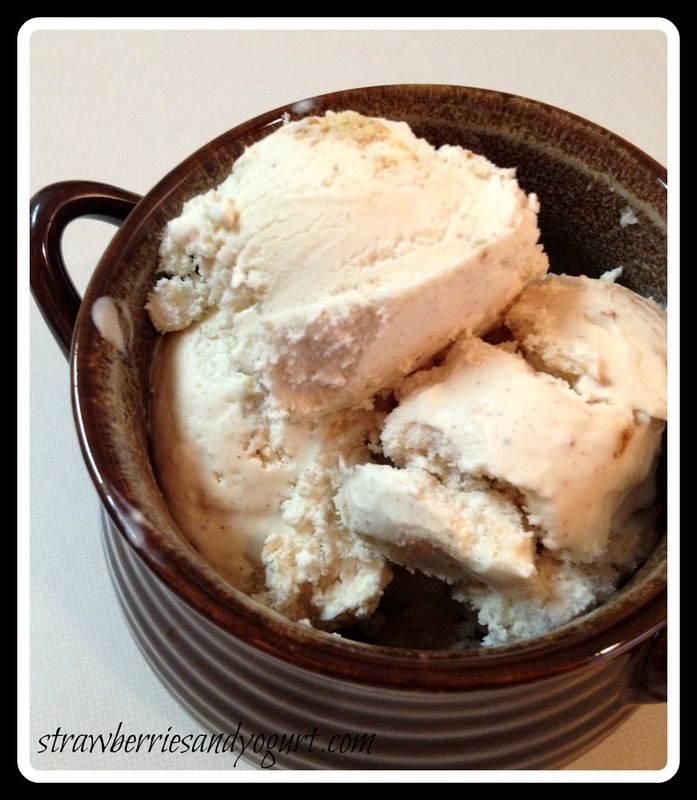 For the ice cream I used this recipe for Coffee Ice Cream from A Cup of Mascarpone. The taste of these sandwiches is divine! BUT I didn’t make the sandwiches quite right and figured out my mistakes a couple days later. I just plopped a scoop of ice cream between two cookies, wrapped them in plastic wrap and put it in the freezer. The idea was there, but the execution was pretty messy. Next time? I will freeze the ice cream in a shallow dish between two pieces of parchment paper for a couple of hours. 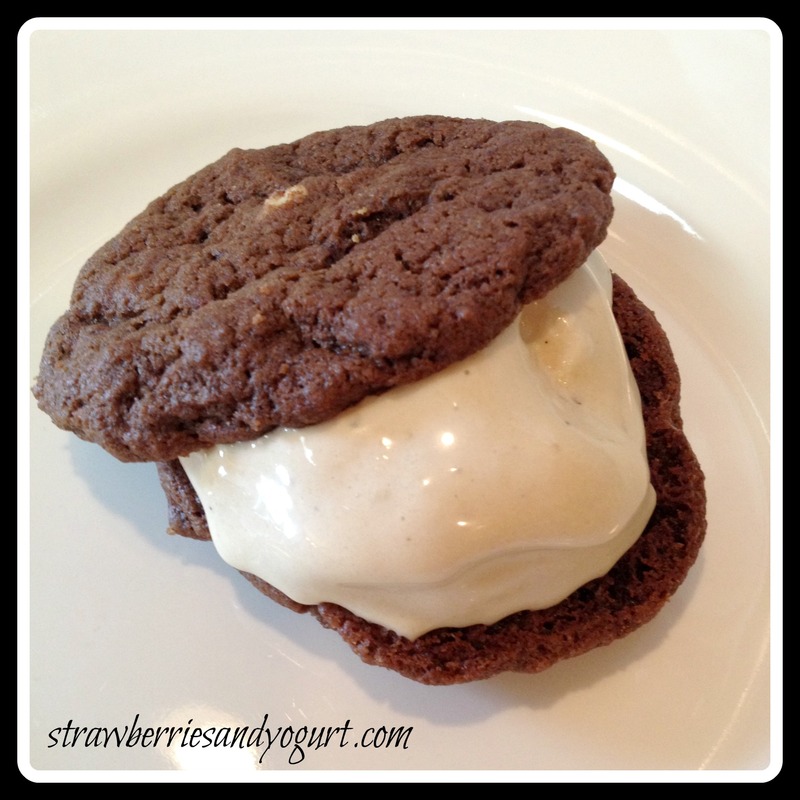 Then use a round cookie cutter to cut out circles of ice cream to put between the cookies. Roll the edges in nuts or even more chocolate, wrap in plastic wrap and freeze. Husband really loves the strawberry & almond bread I’ve been making, but I wanted to try something new. Back to The Bread Bakers Apprentice I went. This recipe is from The Bread Bakers Apprentice. Stir together the high-gluten flour, whole-wheat flour, sugar (if using), salt, powdered milk, and yeast in a 4 quart mixing bowl (or in the bowl of an electric mixer). Add the shortening, honey (if using) and water. Stir (or mix on low speed with the paddle attachment) until the ingredients form a ball. If there is still flour in the bottom of the bowl, dribble in additional water. The dough should feel soft and supple. It is better for it to be a little too soft than to be too stiff and tough. Sprinkle high-gluten or whole-wheat flour on the counter, transfer the dough to the counter, and begin kneading (or mix on medium speed with the dough hook). Add more flour if needed to make a firm, supple dough that is slightly tacky but not sticky. Kneading should take about 10 minutes (6 minutes by machine). The dough should pass the windowpane test and register 77 to 81 degrees. Lightly oil a large bowl and transfer the dough to the bowl, rolling it around to coat with oil. Cover the bowl with plastic wrap. The most reliable method to determine when gluten development is sufficient is called the windowpane test, sometimes referred to as the membrane test. This is performed by cutting off a small piece of dough from the larger batch and gently stretching, pulling and turning it to see if it will hold a paper-thin, translucent membrane. If the dough falls apart before it makes this windowpane, continue mixing for another minute or two and test again. Ferment at room temperature for 1 1/2 to 2 hours, or until the dough doubles in size. Remove the dough from the bowl and pres it by hand into a rectangle about 3/4 inch thick, 6 inches wide and 8 to 10 inches long. Form it into a loaf. 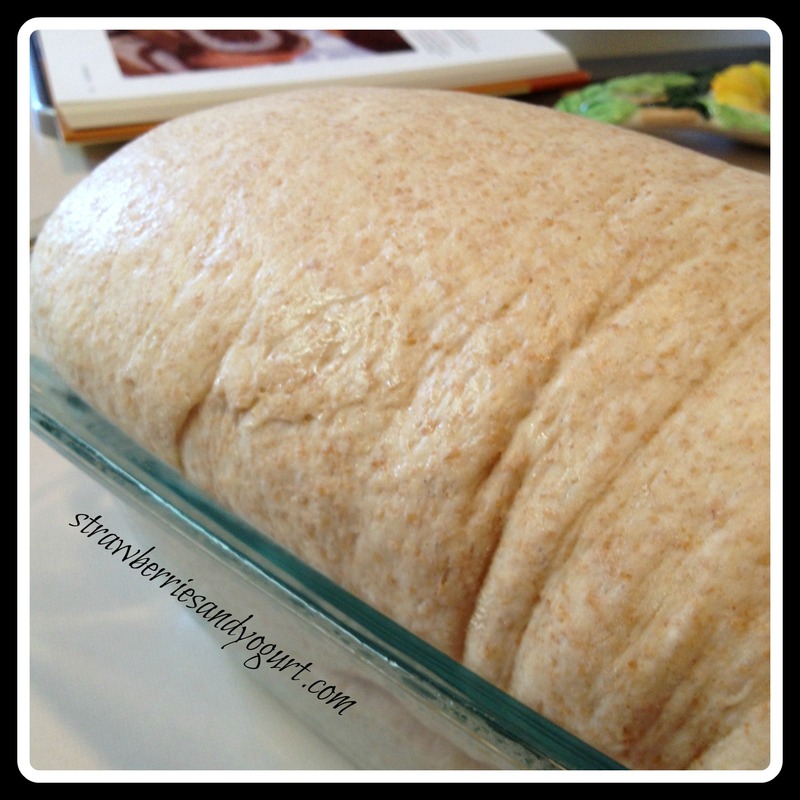 Place the loaf in a lightly oiled 8.5×4.5 inch bread pan. Mist the top with spray oil and loosely cover with plastic wrap. Forming the loaves: Flatten the measured piece of dough with your hand, folding in the edges to make and even-sided rectangle about 5 inches wide and 6-8 inches long. Working from the short side of the dough, roll up the length of the dough one section at a time, pinching the crease with each rotation to strengthen the surface tension. the loaf will spread out as your roll it up, eventually extending to a full 8 to 9 inches. Pinch the final seam closed with the back edge of your hand or with your thumbs. 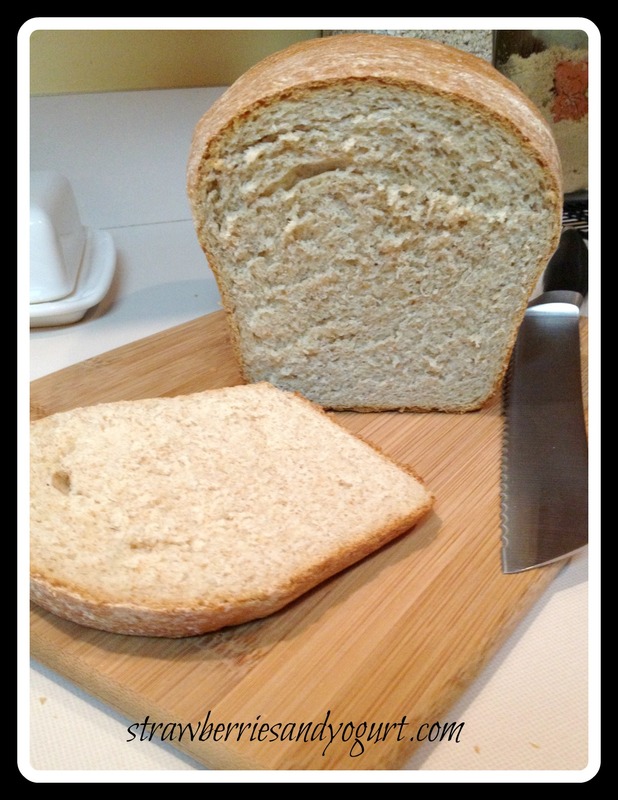 Rock the loaf to even it out; do not taper the ends. 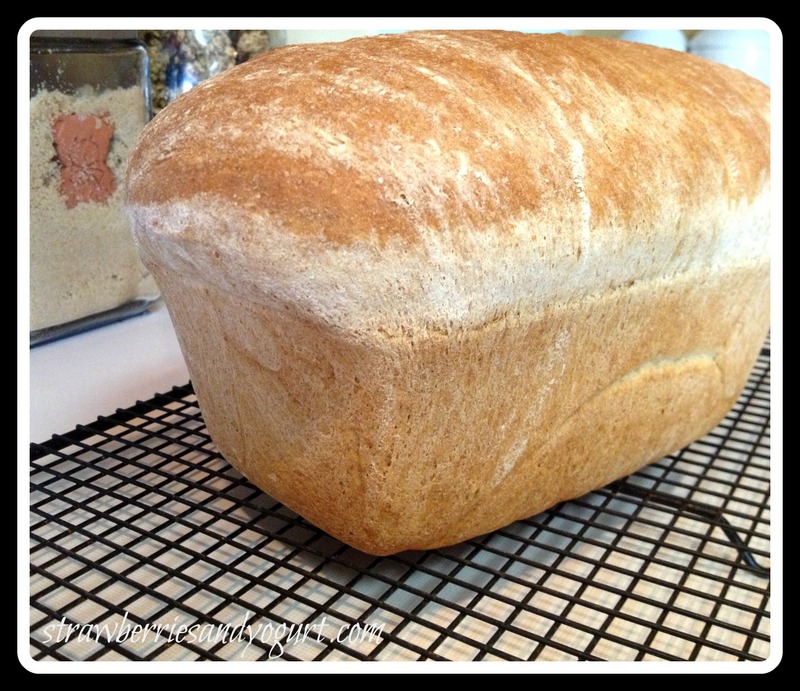 Keep the surface of the loaf even across the top. Place the loaf in a lightly oiled loaf pan. The ends of the loaf should touch the ends of the pan to ensure an even rise. Proof at room temperature for approximately 90 minutes, or until the dough crests above the lip of the pan. Preheat the oven to 350 degrees with the oven rack on the middle shelf. Place the bread pan on a sheet pan and back for 30 minutes. Rotate the pan 180 degrees for even baking and continue baking for 15 to 30 minutes, depending on the oven. The finished loaf should register 190 degrees in the center, be golden brown on the top and the sides, and sound hollow when thumped on the bottom. When the bread is finished baking, remove it immediately from the loaf pan and cool it on a rack for at least 1 hour, preferable 2 hours, before slicing or serving. I laughed when this loaf came out of the oven. It reminded me of the Muppet loaf of bread that showed up on Sesame Street and the Muppet Show. This is a great standard loaf of bread. Toast, sandwiches, whatever. 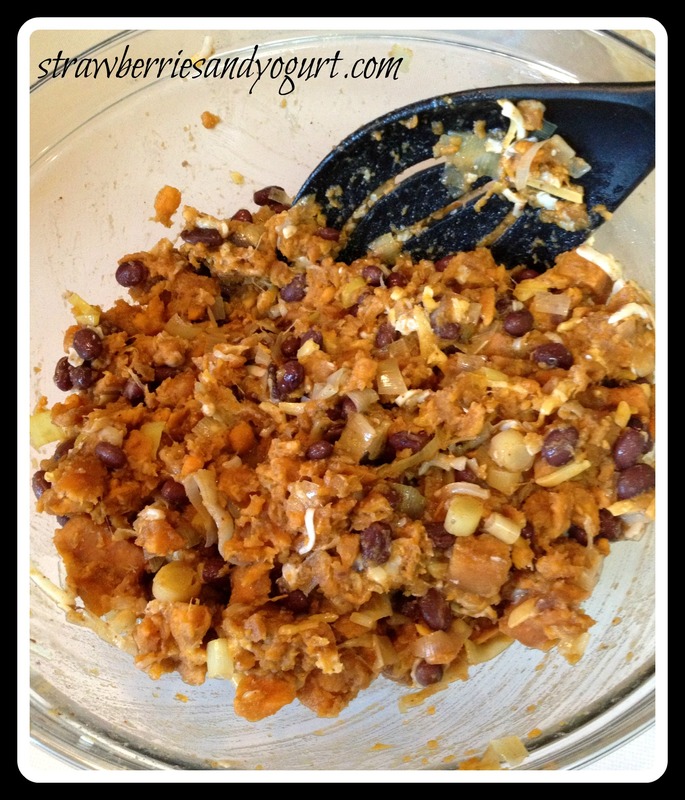 This is a great recipe to have on hand! I remember having bok choy all the time growing up, mostly in my mom’s stir fry. 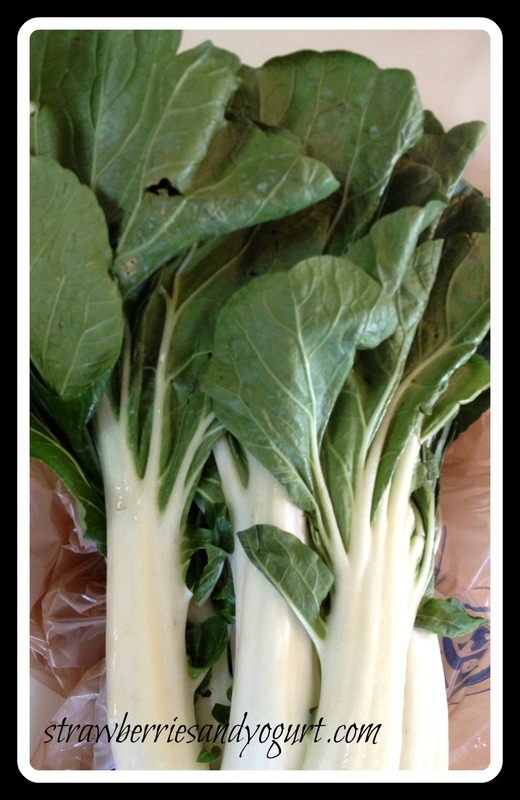 I’ve been wanting to try this recipe, but wasn’t sure if I could find bok choy in Mid-TN. And when I did find it at Kroger, the cashier asked me about a hundred questions. What is this? Whatcha gonna do with it? What does it taste like? I answered as best I could and got home. This recipe is from Real Simple, February 2011. In a 5 to 6 quart slow cooker, combine the onions, garlic, vinegar, soy sauce, brown sugar, bay leaf and 1/4 tsp pepper. Place the chicken on top and sprinkle with the paprika. Cook, covered, until the chicken and onions are tender, on low for 7 to 8 hours or on high 4 to 5 hours. Ten minutes before serving, if the slow cooker is on the low setting, turn it to high. 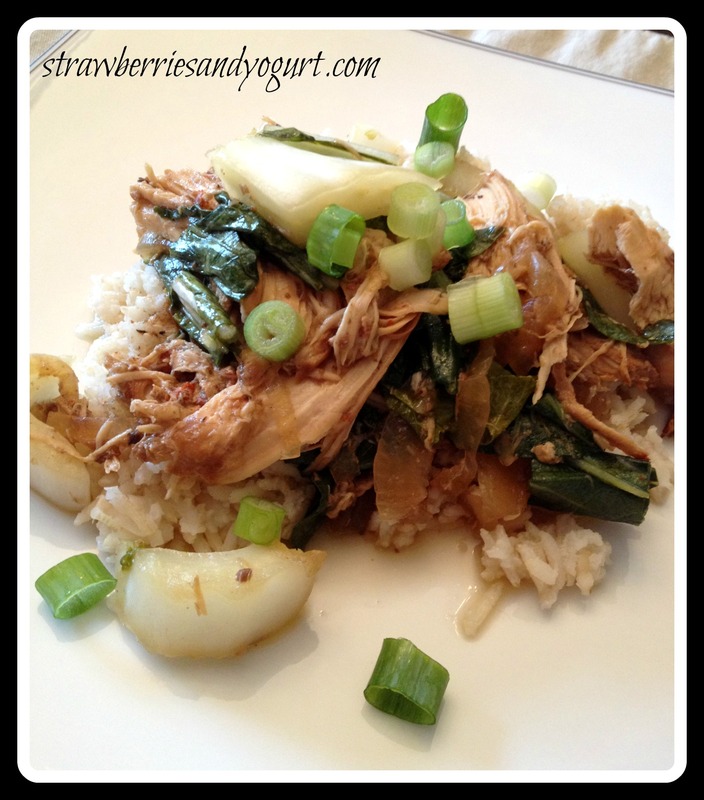 Gently fold the bok choy into the chicken and cook, covered, until tender 3 to 5 minutes. Serve with rice and sprinkle with scallions. The following tip is included with the recipe: You may be familiar with Latin American adobo, which is a spicy mix of chipotle and tomatoes. This Filipino version refers to a dish of meat stewed with vinegar, soy sauce, and paprika. You can easily substitute spinach or chard for the boy choy. This is a fun and super easy weeknight dinner. Throw it in the crockpot in the morning and dish it out for dinner. Plus you get to answer a bunch of fun questions from cashiers when you buy bok choy! All the kiddos are heading back to school soon. Which means lots of lunches, coffees and dinner with these amazing students; telling me of summer adventures, schedules of the upcoming school year, joy, heartbreak, talking for hours and hours. It blesses me and feeds my heart. This recipe is from The Complete Book of 400 Soups. Add the red peppers, carrots, potatoes and celery. Stir well, then cook for another 4 minutes, stirring occasionally. Add the vegetable stock, followed by the peanut butter and corn. Stir until thoroughly combined. Season well. 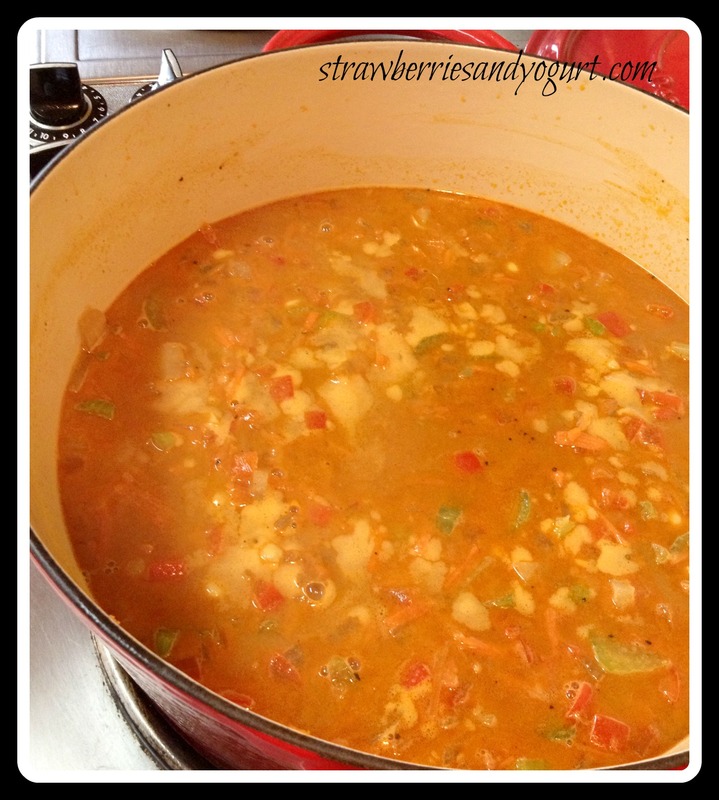 Bring to a boil, cover and simmer for about 20 minutes until all the vegetables are tender. Serve garnished with chopped peanuts. This soup has a great flavor, but not so spicy. I need to remember this cook book tends to under-spice the recipes. Next time I’ll add in some cumin, ginger and maybe some Chinese 5 spice powder. I served the soup over white rice with some shredded chicken thrown in. Husband got me the ice cream maker attachment (for our Kitchenaid Mixer) for my birthday!! We’ve been wanting one for awhile and what better occasion than my birthday?? 😉 My first batch was pretty bad, I hate a learning curve. This is my second attempt. This recipe is from the Penzey’s catalog. Beat the heavy creak in a large bowl until thick (2 to 3 minutes). Fold in the yogurt, vanilla, honey, maple syrup and cinnamon. Pour into your ice cream maker. Add the remaining ingredients a couple of minutes before the ice cream is fully thickened. Pour into a 1.5 quart freezer safe bowl with a lid and chill until hardened. If you don’t have an ice cream maker, you can put the original mixture into the freezer-safe bowl and freeze for 2 hours. Then, stir the mixture and add the graham cracker and toffee bits. Continue to stir it every 2 hours, for up to 6 hours. Then chill until hardened. My second batch came out better than the first. I love the consistency and texture of this recipe, but the tartness from the yogurt is pretty strong. I’m thinking its because of the brand? Third batch is coming soon! Breakfast for dinner. 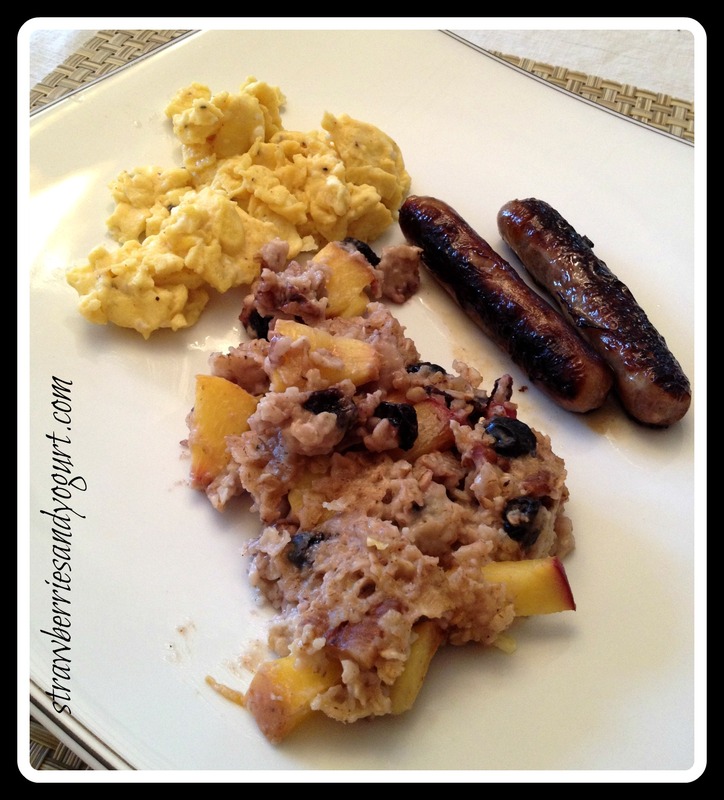 It creates time around the table, eating slowly, talking long with lots of laughter thrown in and enjoying tastes of hearty oatmeal, fluffy eggs and spicy sausage. 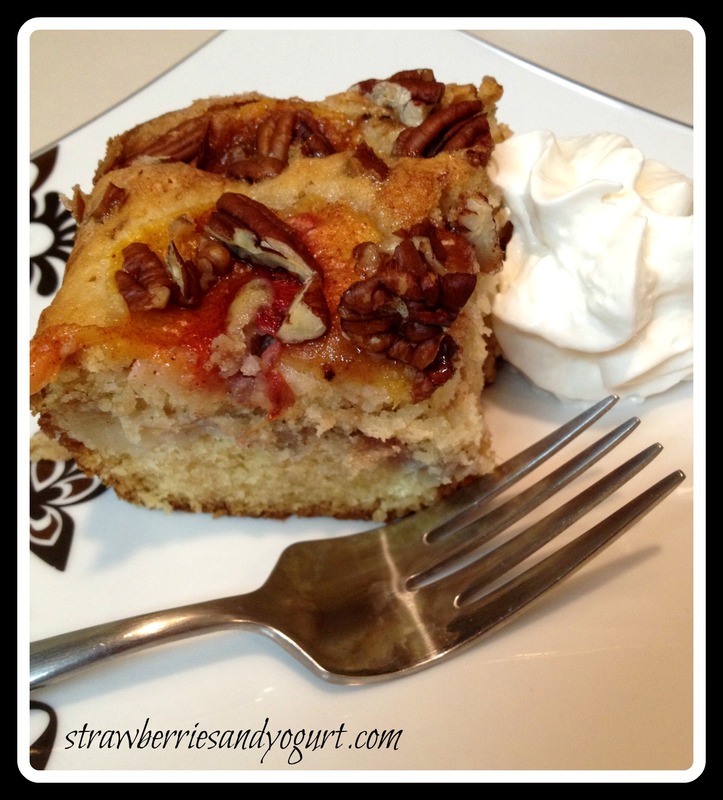 This recipe is from Better Homes & Gardens Biggest Book of Diabetic Recipes. Lightly coat a 1.5 quart casserole (I used an 8-inch square baking dish) with nonstick cooking spray; set aside. In a medium saucepan bring the 2 c milk and butter to boiling. Slowly stir in oats. Stir in fruit, nuts, vanilla and salt. Cook and stir until bubbly. Cook and stir for 2 minutes more. Pour into the prepared casserole. Bake in a 350 degree oven for 10 minutes. Sprinkle with brown sugar. Bake about 5 minutes more or until bubbly around the edge. Cook slightly. If desired, serve the warm oatmeal with additional milk. Somehow I totally missed the part about adding the brown sugar and baking another 5 minutes. It was great anyway, the sugar would have just made it a little better. 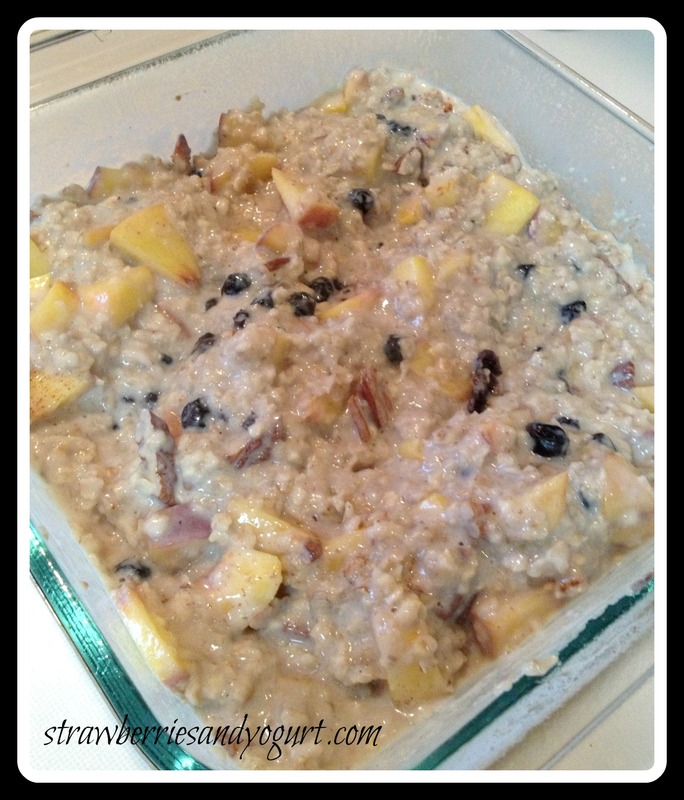 This is a great and quick casserole to throw together with some fresh and dried fruit. This would be great with apples and cranberries in the fall.